Can't get enough Chinese take-out? 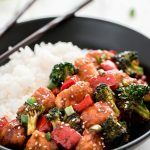 Make this sweet and spicy General Tso's Chicken at home in just 20 minutes. Serve it over rice and you have a complete meal the family will love! Place chicken in a mixing bowl and toss with the cornstarch until all is coated. Set aside. Heat oil in a non-stick skillet over medium-high heat. Add the coated chicken and let it cook for 2-3 minutes until browned. Flip and cook another 2-3 minutes until browned. Remove chicken onto plate. Add the broccoli and bell pepper to the skillet and stir fry for 2 minutes. Add the chicken back and pour on the sauce. Toss and cook for 1-2 minutes until sauce thickens. Remove from heat, sprinkle with green onions and green onion, and serve over rice.